Fermentation is on the rebound! And considering it is probably the oldest form of food and beverage preparation known to mankind, this resurgence is a long time coming. That’s right. Even before the scintillating discovery of fire, our bumbling ancestors had probably already found ways of storing their roots, grains and vegetables that made them more nutritious and delicious. Not to mention mood-enhancing, of course, because beer and wine are both products of fermentation that our species has enjoyed since time immemorial. You know it in your gut, and the science confirms it: the benefits of naturally fermented probiotic bacteria are multitudinous. Whether you’re aiming to promote better digestion, trying to alleviate anxiety and depression, or simply looking for a good buzz, there’s a fermented culture to meet your needs. Amidst this flurry of fermentation, legions of would-be mad scientists are now brewing all manner of probiotic cultures in their own homes, filling cupboards, pantries and laundry rooms with jars of pickles, sauerkraut, kimchi, ginger ale, and don’t forget the sourdough baked goods! So it all starts with salt and cabbage; the ingredients could not be simpler. And the result is a delectably savory side dish, sour, but not salty. So how does it work? The secret fuel driving the engine of sauerkraut fermentation is a little something called Lactobacilli, which is just a fancy way of saying, lactic acid-producing bacteria. The lactic acid-producing bacteria come in a few varieties, but generally they are anaerobic, which means that they thrive in an oxygen-free environment. Sauerkraut actually contains both Lactobacilli and Leuconostoc, which are technically microaerophiles, meaning they need very little oxygen, which they find in ample supply in the top half inch or so of your well-sealed jar or crock pot. The first stage of fermentation begins with Leuconostoc mesenteroides, as it consumes that bit of oxygen and replaces it with (or converts it into) carbon dioxide. You can observe this process by watching the bubbles rise and fizz in your jar. With the oxygen depleted, Lactobacillus plantarum and Lactobacillus cucumeris now kick into high gear, raising the acidity ever higher (or bringing the pH ever lower). As this happens, the bacteria is essentially living off of the salt in your recipe and the sugar occurring naturally in your cabbage. At the same time, the increased acidity creates an environment hostile to unfriendly bacteria and fungi. Eventually, about the time the acidity reaches 2-2.5%, the sauerkraut will achieve a sufficiently sour flavor and stop fizzing. Store in a cool, dark place, for about 2 to 3 weeks, and burp them in once in while to be sure that your jars don’t explode. And easy as that, it’s ready to eat. This is basically the same process used to turn cucumbers into pickles, or do most any other type of pickling. But there of many types of fermentation involving all sorts of yummy bacteria varieties. Experiment with care, and may the fruits of your methodology be always delicious! FURTHER READING: You might also enjoy our popular article on the nutritious and delicious properties of Edible Bamboo Shoots. PHOTO: Homemade jars of sauerkraut and kimchi in my kitchen. Three and a half years later, the “Kale it’s what’s for dinner” design remains our all-time best selling t-shirt. Printed on a super soft blend of 70% bamboo and 30% organic cotton, and emblazoned with a snarky yet whimsical message that promotes good nutrition while poking fun at the artery-bursting beef council and the tooth-rotting soft drink industry, it’s something almost everyone can get into. 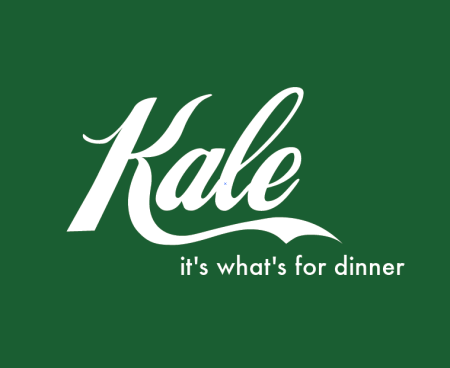 While we parodied the beef slogan and the coca-cola logo, it’s interesting to see how others have taken liberty in posting our “Kale it’s what’s for dinner” design, unattributed, on their websites and Facebook pages. But that’s OK. Like bamboo, kale is a renewable resource, and unlike some things, there’s more than enough of it to go around. So go ahead and dig in, because kale is still what’s for dinner, not to mention breakfast and lunch. And, of course, it makes a great snack! A big part of healthy living is definitely healthy eating. After taking a couple of classes from Virginia at Vert Foods, we’ve been on a sourdough kick. A healthy sourdough starter on the kitchen counter and endless possibilities at your fingertips. Here’s a super easy recipe that I adapted, replacing the commercial yeast with my starter. There are many reasons why you want to use the wild yeasts of a sourdough starter over the commercial yeast available in every grocery store. If you follow Vert Foods on their Facebook page, you’ll learn about this and much more. *For making the bread spice, grind 2tsp fennel seeds, 2tsp anise seeds, 2tsp caraway seeds and 1 tsp coriander and mix. Store in an airtight container. This makes enough for about 4 loaves. ingredients, note: I didn’t have enough whole wheat flour when I made this loaf, so I added some oats and soaked them in the sourdough starter overnight. Instructions: The night before you want to bake, mix all ingredients EXCEPT the seeds into a loose dough ball in a non-reactive bowl (glass). It’ll be very sticky. Cover and let it rise overnight. In the morning (or whenever you’re ready), deflate the dough, which will be significantly bigger and bubbly by then, and fold in the seeds. The dough is very wet, but it should stick together more than sticking to the bowl. Grease a bread pan (mine is a 5.5” x 10.5” pyrex pan) and sprinkle it with corn meal or wheat bran (optional). Poor your dough into the pan, sprinkle it with a bit of flour, cover it with a towel and keep it in a warm spot. I use the same towel for this every time. It has flour on it and I keep it in my proofing bowl. After an hour or so, test the dough by poking it gently with a finger. If the hole dent pops half way back out, you’re dough is ready for baking. If it pops right back out and disappears, let it rest a little longer. (Read more here about the myth of “double in size”) Depending on how warm your selected spot is, this takes 30 min to 2h. About 15 min before you think you’ll be ready to bake, preheat your oven to 450º. When your loaf is done proofing, mist it with water and sprinkle more seeds, oats, etc on top. Put it into the oven and bake for 20 min. Then turn your oven down to 400º, mist the top of the loaf again and return to oven for 25 more min. Let it sit for a few minutes, then take it out of the pan. Wrap it into a towel and let it cool down completely before you cut into it. We have great selection of awesome bamboo cutting boards and I also highly recommend a good bread knife. I’m just starting out with sourdough baking, so if any of you seasoned bakers out there have any tips on how to improve this recipe, please chime in and share your secrets! 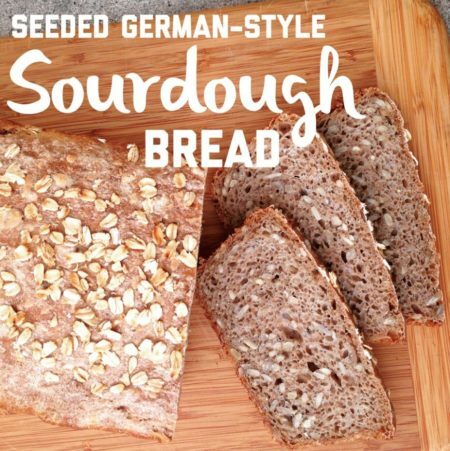 What’s your favorite sourdough recipe? Please share! *EDITS & NOTES:* You can make a simpler bread by just using water, flour, salt and sourdough starter. Leave the seeds and bread spice out, or just sprinkle some seeds on top before you put the bread into the oven. It’s just as yummy, I promise! Also, you don’t have to put corn meal or wheat germ into the pan either. Just grease it generously, and when you’re bread comes out of the oven, let it sit in the pan for a few minutes. It should come out relatively easily. Heading up the coast anytime soon? You probably should. Gonna get hungry on the way? I bet you will. Have you tried Centrally Grown? You absolutely must! Yes, the first turn after Cambria, just across the highway from Moonstone Beach, there’s a charming little turn off called Exotic Gardens Drive that will lead you directly into an enchanting food forest, cafe, grocery store and paradise known as Centrally Grown. Whether you’re picking up groceries to picnic in Big Sur, grabbing a quick sandwich, or seeking an all-afternoon diversion to sip wine, admire the ocean view and stroll through the immaculate edible gardens, Centrally Grown on the outskirts of Cambria has all your needs met. Everything is made fresh, and all variety of diets are served and satisfied, from vegan to paleo, gluten free to pastry junkie. The juice bar abounds with the vivid palette of oranges, reds and greens that comprise their super-nutritious smoothies. Daily specials incorporate local seafood, grass fed meats, and estate grown veggies of every stripe. Living on the Central Coast, where we daily enjoy a choice of two or three farmers markets for fresh grown produce, we’ve known for some time how spoiled we are. But no place drives that point home like Centrally Grown. Of course, they also boast an impressive list of local wines and beers, and there’s even a cocktail bar outside by the gardens where their charismatic mixologist serves you in style. And yes, this is kind of place where even the bartender has the kind of glow that you would only associate with a superlatively healthy lifestyle. Put it on your itinerary or make it your destination; with the abundance of stunning attractions in the immediate vicinity, here’s a day trip that just gets better by the mile. Last week I waxed rhapsodic on the dignity and utility of the reusable bamboo spork, and some of our other travel-friendly utensils. But then I remembered one more essential item for the family picnic: the Frisbee®. Made in San Gabriel since 1957, the Frisbee® is a California original. And at Bambu Batu we offer genuine Wham-O brand Frisbees® fashioned from recycled polypropylene plastic. Think of it as an ecological improvement on an old favorite. Now let me tell you why I love to play Frisbee with my daughter. First of all, there’s no scoreboard, and that’s a big plus. You’ve got your throwing, chasing and catching, but no winners or losers; and when you’re in preschool, the idea of winning or losing can be a big distraction. In fact, it can even be a problem for those well beyond their preschool years. Of course, there are many other forms of catch that do not involve scoring goals and points, but there’s something magical about the controlled flight of a 175-gram disc. Whereas most sports balls are designed to defy and penetrate the elements, in the form of something like a compact sphere, the shape of the Frisbee exposes you to the will and whim of the wind, while also allowing you harness its free energy. That Nature has a will of her own, and is not simply another force or object to be mastered and subdued by Man, is a valuable lesson of which we can all be reminded. In releasing a Frisbee into the air, one must be attuned to the presence of the wind, its speed and direction, and throw the disc accordingly, with tact and composure. Trying to overcome a high wind with strength alone will only bring frustration. Instead, the Frisbee wielder must angle his or her throw to catch the breeze and ride its current across the sky and over the open field in a wide arc. Likewise, the receiver must also gauge the wind and anticipate the disc’s changing trajectory. Understanding the abundant energy produced by the wind, the sun and the elements that surround us, and recognizing that these elements can also be capricious, are skills that are certain to prove valuable throughout life. We could also extol the virtues of surfing, another excellent sport to instill self control and environmental stewardship, but as far as picnics are concerned, nothing beats a good round of Frisbee and the satisfaction you get from watching your well-tempered toss as it rises dramatically over the picnic area, bends around the grove of juvenile redwoods and drifts gracefully into the eager arms of your offspring. And I’m sure she feels roughly the same way when she tosses it back to me. These days, Lindy LaRoche is one popular lady. As the owner of the Poppy Soap Company based in Los Osos, she has seen the demand for her amazing handmade soaps skyrocket. Adding new accounts almost every day, the business has attracted the attention of wellness centers and stores across the country. The Four Seasons recently discovered her creations and have started featuring them in their spas. Her Bar for Bar program, which donates soap to a women’s shelter of the customer’s choice, has grown to include organizations nationwide. As of the beginning of October, she has donated over 3,000 bars of soap! In an effort to expand their operation, Poppy Soap Company has launched an Indiegogo campaign. Those who make minimum donation of $24 will receive three of their fantastic soaps at a cost below their website price. Gifts will be shipped in December, just in time for the holidays. Of course, you can always find her therapeutic soaps here at Bambu Batu! We are proud to carry her Bamboo Charcoal, Peppermint Pine, Sea Buckthorn Satsuma, Lavender Lemongrass and Lemon Poppyseed soaps. Local Central Coast resident Lindy LaRoche create the Poppy Soap Company back in 2011 out of a desire to start a home-based business that she could operate without being away from her son who was just a toddler at the time. And equally important, Lindy wanted to be part of a business that gives something back to the community. Always a creative and motivated individual, soap making is just one of Lindy’s many skills. When she learned the soaps were the number one item on the donation wish lists for Women’s Shelters, a great big light bulb came on. “What if I give the Women’s Shelter a bar of my delicious homemade soap every time I sell one?” And so the Bar For Bar Program was born. Bambu Batu is thrilled and delighted to have such a thoughtful and wonderful woman as one of our business partners in our ongoing effort to raise consciousness and heal the soul of the planet. Recipe serves two simple meals or four lip-smacking kale salad appetizers. Prep time approximately 15 minutes. No cooking involved. Start with one hearty bunch of kale — Tuscan, dino, curly, any variety will do. Carefully remove the leaves and tear into more-or-less bite sized squares, discarding the fibrous stalks into your nearest compost receptacle. Then add roughly 1/4 cup of minced red onion, to taste. Let the onions soak in the juices for about 10 minutes if you want to take the edge off of the raw onion flavor. Pour the dressing over the bite-sized strips of kale and massage gently and evenly until the kale feels tender. NOTE: it is important to actually massage the kale, rubbing and squeezing with your hands to really get the oil and lemon juice in there and soften up the leaves. Finally, sprinkle with roasted pepitas and call it done. You can add a pinch of salt and pepper, but it’s really unnecessary. You can also add other salad toppings, depending on what’s in season. Our summertime kale salad often has fresh tomatoes and avocado. Serve it up with some homemade sourdough bread, and you’re good to go! Mothers have reported that “the teenagers just devour it!” But rest assured, ordinary children and adults clearly crave it as well.